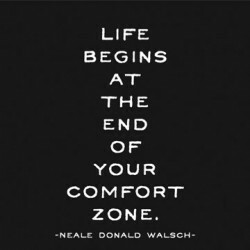 My daily inspiration…..given to me by my sister Amy. I just completed week 5 of my ultra training and am I am feeling very accomplished. I am more determined than ever to nail this race. 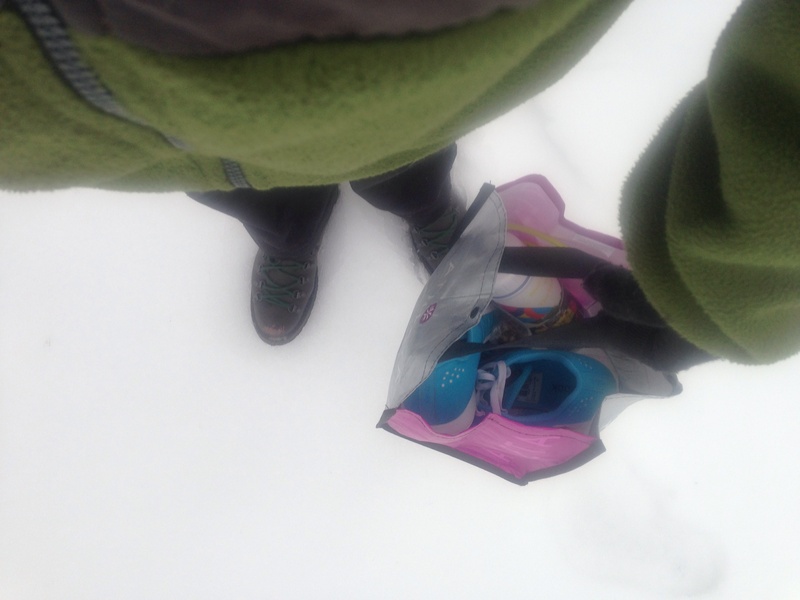 My snow/ice trek to get in my CrossFit home WOD work out in with buddy Kathryn. I have nailed every workout on my training plan and am committed! I have never nailed every work out on any previous training effort. Why is this different? I am not really sure other than the fact I don’t like to fail. My first ultra attempt was a FAIL! I am stubborn, hardheaded, and I don’t like to fail. While nobody has ever question my ability, for me… the successful completion of this ultra is 100% personal. I have a score to settle with myself. 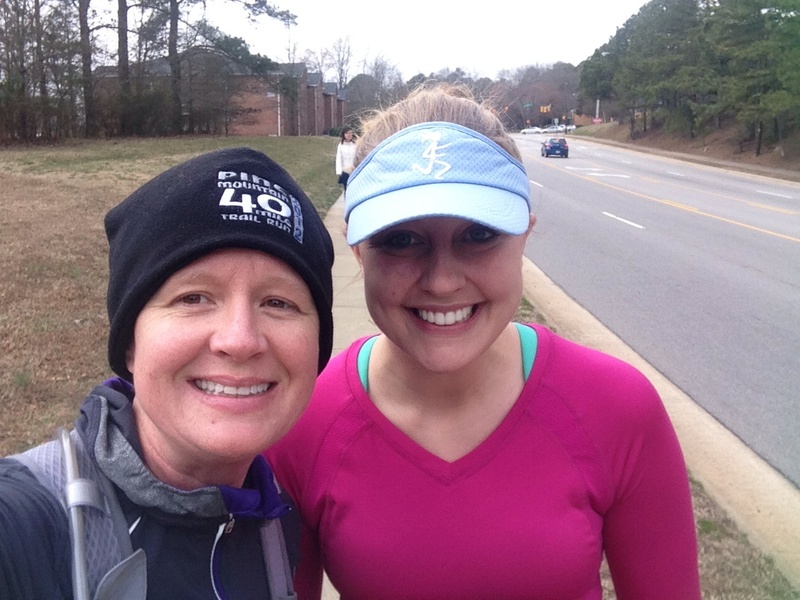 This weekend I exceeded my personal distance record by running 31 miles. Prior to Saturday, my longest run was 28 miles ( my 1st ultra attempt). 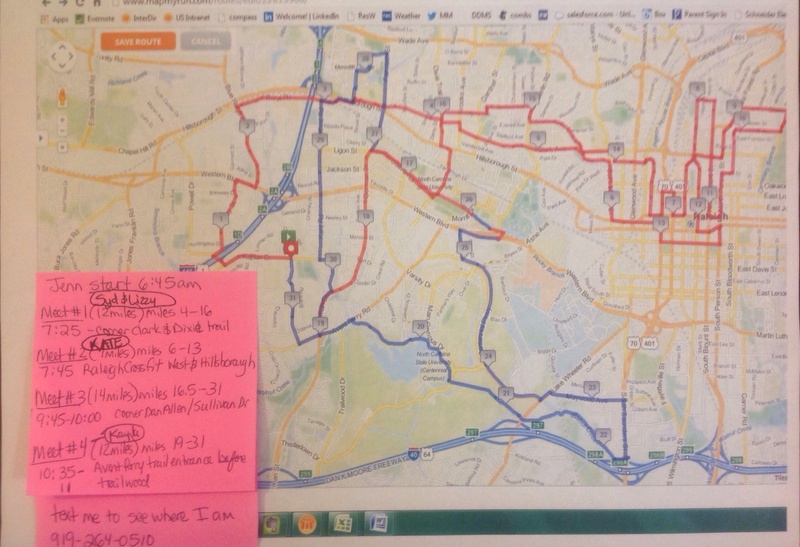 In prep for Saturday’s training run I was mentally, physically, and logistically prepared. I knew I could conquer the distance. 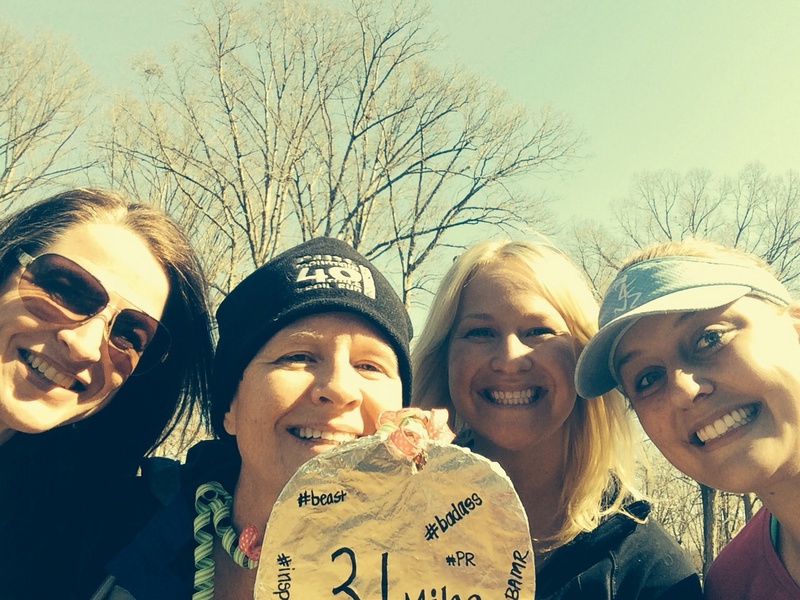 I rallied my non injured running peeps and they eagerly signed up to join me along my route! It was amazing it made the miles go by so quickly. I honestly could not have gotten through this without the company. 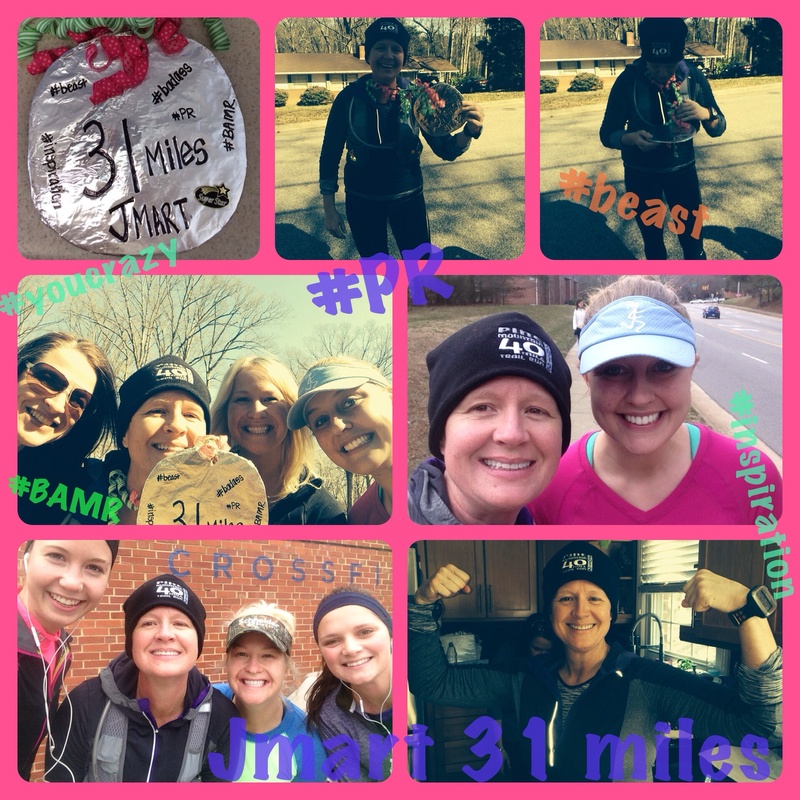 I only ran 3.5 miles alone( 15.5-19)! . Thanks BRF’s! Our first stop mile 6 to pick up Kate! 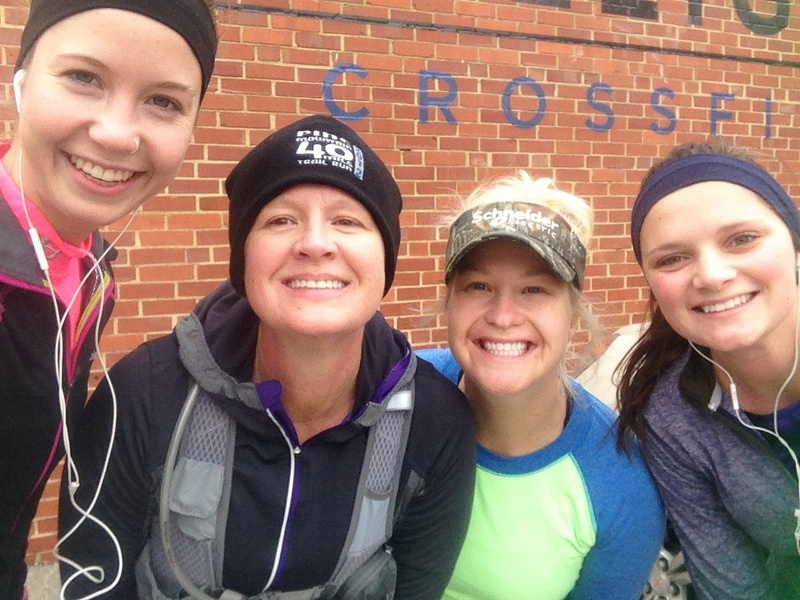 Super shout out to Lizzy and Syd ( on ends) College Sophomores training for their first marathon, started with me at 6.45am for their 18 mile run! Impressive…I never did that in college. I felt good the entire run. Don’t get my wrong… around mile 20 I was certainly tired and my hamstrings were screaming at me but I listened to my body and threw in some longer walking sessions. I know I will have to walk much more on race day. My fueling, every 45 minutes, was right on! Thanks Byron Powell, author of Relentless Forward Progress for the awesome tips. Byron’s book has equipped me with so much knowledge and confidence. Back to fueling…while at times my fueling alarm seemed too often, I made my self eat, take my salt stick tabs, and flush it down with my strawberry lemonade Nuun. I also tested out my homemade protein balls which were super yummy. They will be a new race day staple. My consistent fueling and hydration effort paid off. As Kayla and I ran the final .25 up the HILL to my house, Kayla was determined to conquer the the hill as it defeated her several weeks prior. I joined her pursuit and powered to the finish. I was pretty darn excited to be almost done. As we crested the hill, I spotted a car in front of my house. Out popped out Kate ( who ran 7 miles with me) and Kathryn ( who trashed her knee on the trail run the week prior) they were there to greet me and congratulate me on my 31 mile accomplishment! I was blown away! The support and encouragement from my friends through out the day moved me to tears. Tears of joy and tears of celebration! They presented me with a homemade personalized medal! #SUPERBLING I will cherish it forever! It is happily displayed on my medal rack. It is my #1 all time favorite! So here is to a great week of training and most of all great friends! Friends make seemingly impossible task doable! This entry was posted in CrossFit, Ultra, Uncategorized, Womens Running and tagged Byron powell, cedarIsland40, CrossFit, irunfar.com, nuun, Raleigh CrossFit, Relentless Forward Progress, running bling, running friends, salt sticks, ultra, ultra training, womens running by BoxerRunner100. Bookmark the permalink.